I may be getting into the Christmas spirit. Last year was the first holiday without my husband Alan. I was barely functioning back then. But this year, thanks to the tender care of my best friend Tamara and her wonderful husband Warwick, I'm feeling more myself. Having Alan's grad assistant move into the house was his idea, and his final kindness to me. Delia Greenway helps me run the old place, and keeps me on my toes. My house calls for holiday decorations. Since I live in the historic district of Goosebush it calls for a bit of attention, but in a classic way. Delia takes care of the front of the house, and for the last couple of years, that was as far as decorating went. That wasn't always the case. When my father was alive, the house was a Christmas wonderland, with different decorations in every room, and a winter playland in the back yard, complete with a train set that went around the different bushes and plants. What folks didn't know is that he kept the lights up all winter long, to help illuminate the long New England winter nights. I'm not up to a holiday open house this year. Maybe next. But I will decorate. Delia and I have been working on making different wreaths from different plant pruning efforts. I have become a fan of rosemary wreaths. What a wonderful scent! Delia has been working wonders with other plants, and we're adding evergreens to fill in spaces. So yes, thanks to my friends I'm feeling better. Who knows, maybe next spring I'll have a garden party. That could be fun. The book is available for pre-order. Today I have an ARC to give away to someone who comments on the blog! I love writing this series, and so look forward to all of you getting to know Lilly and the rest of the Garden Squad. The winner will be chosen on Friday, November 23. Happy Thanksgiving to our US readers! Please enter me. I love to start new series. A gardening series is going to be such fun! Thank you for giving away this first book! I am looking forward to reading it. I always look for new series and I would love to read your garden series. Wishing you and your family a Happy Thanksgiving. This sounds like a wonderful series. I would love to read more. I have yet to read a book by this author. Would love to start with this one that sounds interesting. Love the sound of this book! Great start to a new series, would really like to read. Happy Thanksgiving! I love ARCs and the idea of finding her in mulch! 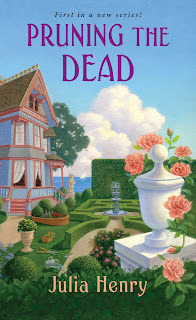 The Garden Squad series sounds like it's off to a grand start with "Pruning the Dead". 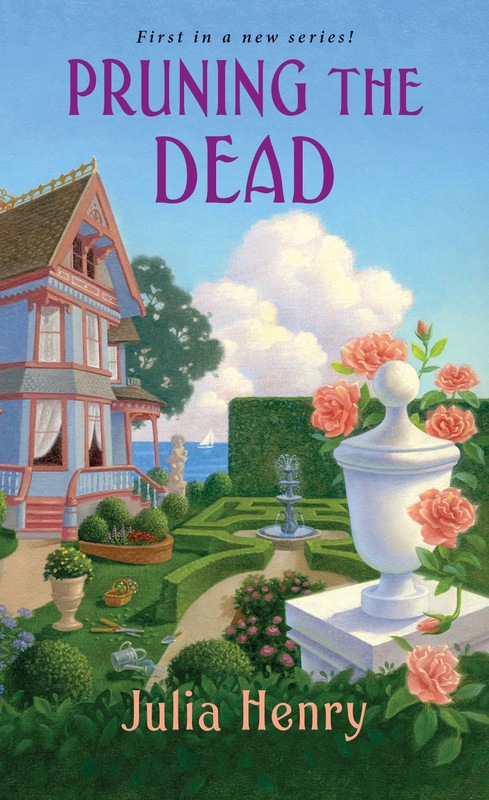 I'd love to read more about Lilly's garden party and the solving of Merilee’s murder. Along the way, I could learn more about Goosebush and all it's inhabitants. Thank you for the wonderful chance to win a copy of what sounds like an amazing book and one that has been placed on my TBR list! Charming cover. Thanks for the opportunity. Sounds like a great series to start out the new year with! Thank you for your offer. Sounds great!! Love the cover! Thanks for the giveaway. This book is one that I will read as soon as I can get it! You are a new to me author! Love finding new authors and books. This one looks great. Thanks for the giveaway and Happy Thanksgiving. After going to school in Boston, I miss and love the east coast. Can't wait to read this one set in MA! I am an avid gardener, too, so I look forward to this new series. I enjoyed the backstory that Lily provided in the first part of the post. Makes me feel as if I already know her a bit, so it will be a treat to read about her in the first book.